Have you been caught out recently with Windows automatically upgrading you to Windows 10 even though you’ve not consented to the upgrade? 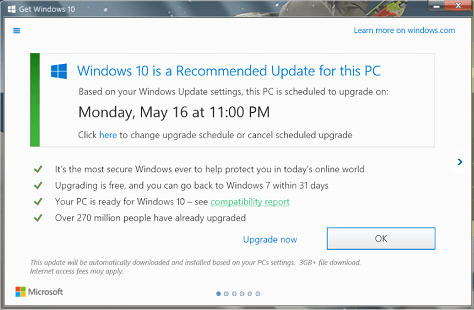 Well, with just two month remaining to upgrade to Windows 10 for free, Microsoft are turning up the heat with what appears to be a rather sneaky push to get people to upgrade. The latest tactic is to turn the X in the top right hand corner of the upgrade prompt box (the one that usually dismisses a dialogue box) into a ‘Sure, I agree to this upgrade’ action.